LHASA -- The oldest person in Tibet celebrated her 117th birthday in Lhasa on Sunday. 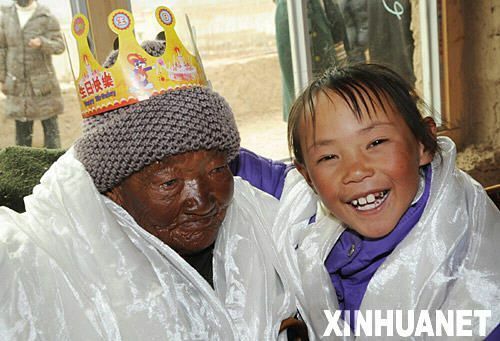 Amai Cering, born in March 16 in 1891, was treated to a celebration of Tibetan entertainment and a birthday cake courtesy of the local government and fellow villagers in Jiarong village, of Linzhou County, Lhasa, on Friday. Her sight and hearing have deteriorated in recent years, but she smiled and murmured amid the music at her birthday party. She has borne two sons and two daughters, but only one daughter named Yangjian is still alive. Her 36-year-old granddaughter Xiaobai is caring for her mother and grandmother. "It is a great privilege to look after her as she is precious to our family," Xiaobai said. Amai Cering lives on a government pension and donations from local companies. She said she is happy with having meat every day. She leads a regular life, rising at 8 a.m. and going to bed at 5 p.m.every day, Xiaobai said. She enjoyed sitting in the yard for sunshine and eating four meals a day. "Grandma has a good memory and likes to talk about the old days with us," Xiaobai said. With economic development and improved medical care in Tibet, the lifespan becomes longer. Linzhou County has four centenarians. The average age in Tibet has risen from 35.5 in 1969 to 67, according to official statistics.